One advantage political scientists have over the media or pundits is that we have the luxury of revisiting earlier projections/explanations in light of new data or theorizing. This is an advantage when writing a blog that tries to focus on the fundamentals driving political events rather than simply opining on the latest topical event. In particular, when my projections prove wrong (a not infrequent occurrence as long time readers know), I see that as an opportunity to learn in the hope of increasing our understanding of political processes and outcomes. At least that’s the goal. In my defense, then, at the time I made my initial projection that Specter would not change his voting spots, I assumed he was primarily focused on a challenge from the Right, not the Left. As I warned at the time: “Of course, if he gets a credible challenger on the Left in Pennsylvania, then all bets are off!” However, I discounted a primary challenge in the belief that the Obama administration had negotiated a deal with Pennsylvania Democrats to give Specter an open field to the Democrat nomination. That assumption turned out not to be true. Since Specter’s switch, we have been reminded just how little clout presidents have in local party affairs, and how the decision to run on the party label for a Senate seat in American politics is no longer controlled by party leaders. Specter in fact faces a very credible challenger on the Left in the person of Joe Sestak. At the same time, my projection was made before the full scope of the anti-incumbent wave that now appears building in the run up to 2010 became evident. Not only does Specter face a primary challenge – if the latest polls are to be believed, he is in danger of losing! Although Obama has kept his promise to back Specter (and has even run ads on Specter’s behalf), the latest Pollster.com composite polling graph has the Democrat Senate primary in a virtual dead heat between Specter and Sestak. Now, there are between 10-15% of undecided voters in these polls, so Specter may yet pull this primary out. Nonetheless, this is a far cry from the “open Democrat field” on which I premised my earlier projection. The irony is that Specter’s move left did nothing to dissuade Sestak from opposing him, and yet has likely made it more difficult for Specter to win the general election; even if he beats Sestak in the primary, polls indicate he will lose the general election to the Republican Pat Toomey. It would have been far better for Specter’s electoral fortunes, I think, had he maintained his traditionally moderate voting record. There are two important points to take home here. First, Specter’s potential demise – either at the hands of a Liberal Democrat or a Conservative Republican – is another reminder why we have a polarized Senate. It’s not because voters in a general Senate election are more polarized – it’s because they often are forced to choose between two relatively polarizing candidates. One could argue that neither Sestak nor Toomey are as broadly representative of the median voter in Pennsylvania as is Specter, but that may not matter if Specter’s not on the ballot in the general election. Second, the signs continue to suggest that the anti-incumbent sentiment is shared by enough voters – not all of them Tea Party supporters – to make 2010 a potential “wave” election year. Of course, as I have continually cautioned, it is easy to make too much of individual races. If Specter loses, pundits will undoubtedly suggest this is another indication of Obama’s weak political influence. Given the general anti-incumbent trend, and the historical inability of presidents dating back to FDR to influence midterm races, I’m not sure it’s accurate to lay the blame at the White House’s doorstep. Nonetheless, after tomorrow’s Senate primaries (along with Pennsylvania, there are primaries in Kentucky, Arkansas and Oregon), and the Special Election to fill the U.S. House seat in Pennsylvania’s 12th district formerly held by Representative John Murtha, Jr. (Murtha died last February), we will have a bit more information with which to try to assess the lay of the electoral landscape. If I can, I’ll try to summarize the results when the polls close Tuesday night. Meanwhile, with only four predictions in, I’ve extended the window on forecasting the Kagan confirmation vote for another week. Remember, if you are a graduating senior, your job prospects will undoubtedly be helped if you nail this projection. I am told that Mike Norris, a previous contest winner, used his victory to get a lucrative (six figures) job working for Bill Gates as a technology forecaster. Senator Arlen Specter’s decision to caucus with the Democrats has, temporarily, pushed the “100 days” storyline into the background, and for that we should all be grateful. (For my sole media effort to correct the misperception that 100 days matter, see my brief comments with a Canadian journalist here.) In addition to the blow it inflicts on the Republican Party, at least symbolically, Specter’s defection is another reminder of how difficult it is for moderates to exist in a deeply polarized Senate. 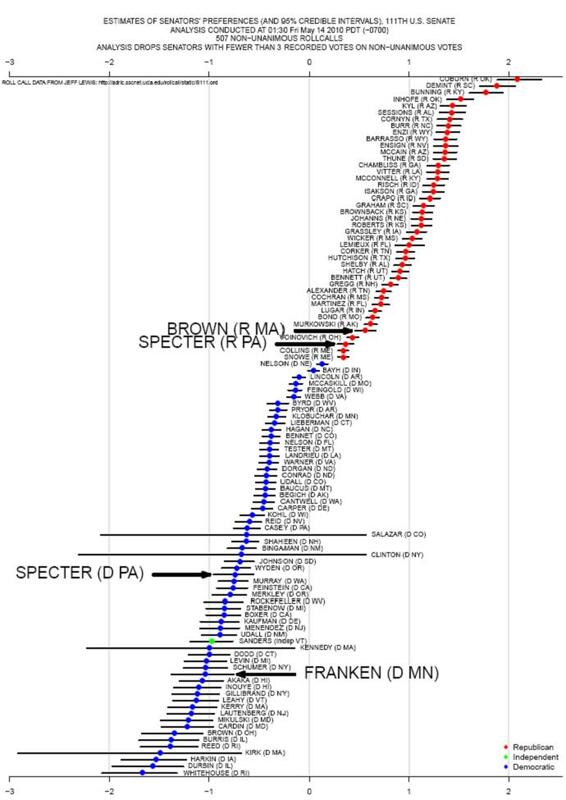 I went back and calculated Specter’s rank, using a generally accepted measure of voting-based ideology (Poole-Rosenthal scores) in each Senate session in which he served dating back to his first in 1981-83 (the 97th Congress). When it comes to voting, Specter consistently falls in the middle of the pack, with an overall average ranking across 15 congressional sessions as the 52nd most liberal Senator (standard deviation of 4.3). (Note that I include the President’s rank score in the data used to calculate Specter’s standing). When the Senate is under Democratic control, the overall mean voting score shifts left, which tends to make Specter more conservative relative to his colleagues; his average rank under Democratic control is 57. Conversely, under Republican control, he ranks slightly more liberal, typically landing right in the middle as the 50th most liberal Senator. On the whole, then, we see that he’s a consistent middle-of-the-road Senator. So, is his voting record likely to significantly change now that he’s a Democrat? At first glance, one might think yes. Indeed, several pundits have suggested as much based in part on political science research on previous party switchers. This research suggests that a switch in party leads to a switch in voting patterns. But caution is in order; most of this research finds significant changes only in the House. In the Senate, because of the small sample size, detecting historical trends is much more difficult. For comparison purposes, I looked up the rankings of four other Senators who switched party affiliation in the modern era to see if it affected their overall Senate ranking. So based on this limited sample, and subject to all the caveats associated with nominate scores and using ranking, as opposed to absolute voting data (and the different time periods being compared), it appears that Shelby’s voting rank changed significantly, but the other three demonstrate less movement. When we think about the issue a bit more, it’s not surprising that this admittedly limited sample reveals no clear trend in voting patterns after a change in party affiliation among Senators, in contrast to Representatives in the House. Remember that the House operates under rules designed to empower the majority party, so in periods of high polarization, a switch in parties should tend to lead to a switch in voting (much as political science research has found.) However, this is not necessarily the case in the Senate, where voting is less beholden to party, and much more driven by individual ideology conditioned by constituency and reelection. In other words, the Senate is not strictly comparable to a parliamentary system, where party leaders often have the means to punish those who cross party lines by, for example, removing them from party lists at election time. In the U.S. Senate, senators are largely beholden to no one except voters. Note that based on Poole-Rosenthal scores from the last (110th) Senate, Specter is the third most liberal Republican Senator, topped only by the two Maine Senators Collins and Snowe. Not surprisingly, all three Republican Senators already voted with the Democrats to pass Obama’s stimulus bill, and there wasn’t a darn thing the Republican Senate leadership could do about it. All this is a long way of saying that I don’t expect Specter’s rather moderate voting patterns to change very much as a result of the change in party label, since he’s already signaled his willingness to cross parties and vote with the Democrats during the current session if it serves his electoral needs. Indeed that is what this switch is about – Specter’s 2010 reelection bid. By switching labels, he can run in the Democratic primary where he (so far) has at least a chance of reelection. If he stayed a Republican, he was going to get trounced in the primary (the most recent poll had him down 21% among likely Republican voters to the more conservative Pat Toomey). For Specter, becoming a Democrat was a matter of political survival – not a change in ideology. By negotiating a deal with the Democrats (including Obama’s implicit promise to back him in the Senate race), he’s hoping to avoid a challenge from the Left in the Democratic primary in two years. If so, I expect him to continue to position himself as a swing voter in a state that is trending Democratic, with his vote determined by his calculations on its likely impact on his Senate reelection chances than on party loyalty. Note also that he negotiated an agreement to retain his seniority, so the switch doesn’t cost him anything in that regard. In short, this is a very significant switch for Specter’s electoral chances, not quite so significant for his votes in the Senate. Of course, if he gets a credible challenger on the Left in Pennsylvania, then all bets are off! If I get a chance, I’ll talk a bit about the filibuster implications in another post. But my immediate reaction is that I don’t see this having as much impact on moving the Democrats closer toward a filibuster-proof Senate as many have surmised because Specter’s vote was already driven almost entirely by electoral, and not partisan, considerations. When it serves his purpose – as it did in the stimulus bill when he was able to leverage money to his state in exchange for his support – he will vote Democratic. But the change in party label isn’t likely to dramatically increase his propensity to do so.